The new Acuter DS PRO series advanced achromatic waterproof spotting scopes are exceptionally stylish and highly functional precision optical instruments. 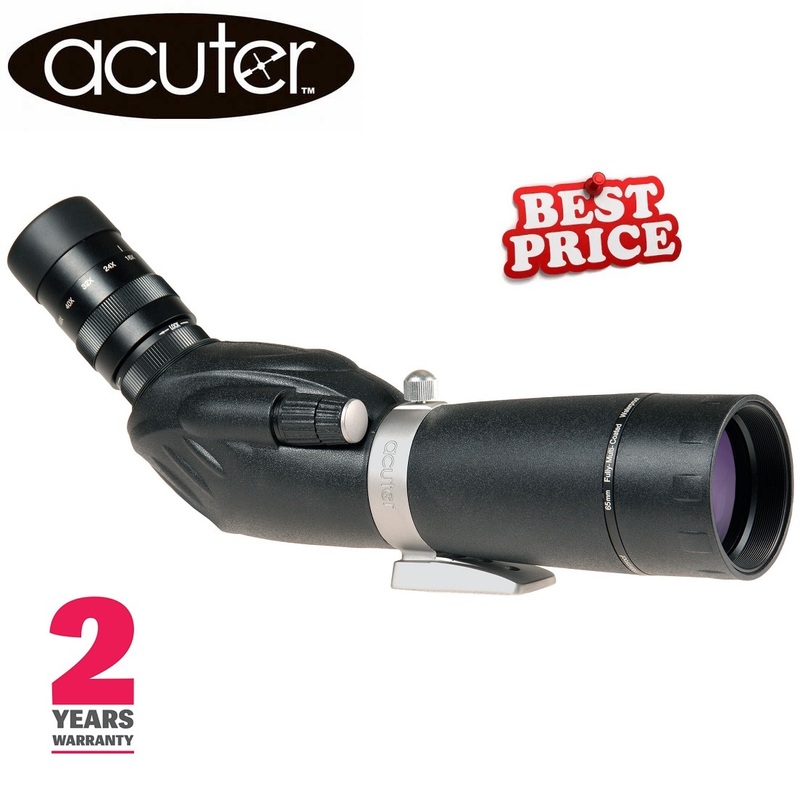 This Acuter DS-PRO DS 16-48x65 Angled Spotting Scope is an absolutely ideal choice for people who enjoy bird watching and also for those who love serious nature observations but that’s not it because this spotting scope is an equally good option for those who have interest in astronomy and target shooting. A user is well justified when he demands his spotting scope to not only be able to produce very good images but should also be a reliable option, Acuter DS-PRO DS 16-48x65 Angled Spotting Scope has the feature of nitrogen filled water proof and fog proof which means that Acuter DS-PRO DS 16-48x65 Angled Spotting Scope is not only good when we talk about some good images but also when one is expecting some reliability. They combine excellent optical performance with many desirable high-end features that make them perfect companions for Bird watching, Serious Nature Observations, Target Shooting and even Astronomy. This Acuter DS-PRO DS 16-48x65 Angled Spotting Scope with its 20mm eye relief is a good option for people who might be glass wearers while robust rubber armoured body which serves the purpose of providing shock resistance and extra protection. Acuter DS-PRO DS 16-48x65 Angled Spotting Scope with its quality features has the full ability and potential in producing outstanding results in shape of excellent images which may help to take the viewing journey of the user to a whole new level of excitement and delight. Acuter DS-PRO DS 16-48x65 Angled Spotting Scope is supplied as standard with a 16x-48x (8-24mm) Zoom Eyepiece but can be used with virtually any standard 1.25" push-fit telescope eyepiece for exceptional versatility. The spotting scope can be fully rotated in its collar to change the orientation of the eyepiece. Keeping in view the convenience and comfort of the user, a user operating instructions manual in case where a person may need some guidance regarding the use of Acuter DS-PRO DS 16-48x65 Angled Spotting Scope is also provided so one can have a good use of Acuter DS-PRO DS 16-48x65 Spotting Scope. With an ability to produce excellent performance which can meet the demands and the expectations of the user in a true way is what makes this Acuter DS-PRO DS 16-48x65 Angled Spotting Scope such an excellent option. For more information about, Acuter DS-PRO DS 16-48x65 Angled Waterproof Dual Speed Spotting Scope website.